Well appointed, 3-level condo blends the new with an old-world, eclectic mix of furnishings from our travels and postings around the world. Each room is fitted with a small touch of Asia, the Middle East or Europe. All this with an unobstructed mountain view make for a very pleasant holiday venue. Vermont summers are not known for excessively long spells of scorching heat so we've furnished the cooler lower level with FANS; The upper living area is equipped with an AC wall unit. On the lowest level, the large master bedroom (king bed) is spacious and has a wall mounted TV and en suite bathroom. A balcony runs the length of the room making a nice quiet place to take your morning coffee. The guest room (queen) on the same floor is small, and sufficient.There is a second full bath in the hall just outside this room. The upstairs area, and air conditioned part of the condo, is semi-open with kitchen, den/TV room and dining/living room and powder room with toilet, sink, washer and dryer. There is a second deck with a gas grill running the length of the dining/living rooms - a wonderful place to catch the great mountain views while dining out of doors. The loft space has 2 single beds - best for overflow guests. And can be VERY hot some summer days - only fans for relief. We've given this space above the living area an open feeling with glass wall panels. Our condo may not be perfect for older people or for toddlers and children just learning to walk, as there are two 8-step stairs to get from the lowest level to the main floor and narrow stairs (see photo) to the loft. There is a lovely pool, dressing rooms and recreation center with a small kitchen and outdoor (charcoal) grill. The pool opens weather depending; usually beginning to mid-June, closes late September. There are 3 tennis courts on property. Pool regulations are 4 people maximum from the same unit at one time at the pool. IF YOU HAVE A DOG, BE AWARE THEY ARE NOT ALLOWED IN THE POOL AREA. Kids enjoy the pool and they can be noisy - they're having fun - please be understanding. There is no town public transportation in Manchester or the surrounding areas, so do plan to have a car, bike, or bicycle or just walk. Vermont is an all season getaway and a five minute walk to town down our quiet, steep hill and you're in Manchester Depot - Starbucks, outlets, grocery stores, Italian deli, liquor stores restaurants, and pharmacies. Southern Vermont Medical Clinic is a 5 minute drive away. SVMC 's team of providers are all part of the Dartmouth-Hitchcock Medical Center in Hanover N.H. and Southwestern Medical Center in Bennington, VT health systems. There is a full-service gym (The GYM, Manchester, Vt) within a 2 minute drive, including a state of the art weight room, fitness classes and personal trainers. This corner of Vermont is an all season destination. Spring hikers, bicyclists, fishermen; Horse show (VSF); summer activities galore, alpine slides; fall spectacular foliage; winter downhill or cross country skiing at many local venues. Dogs are accepted on case by case basis - NO BARKERS! We're not keen on cats. We strive to maintain a clean, well-appointed summer home and wish to provide our space to people who appreciate country life, in others' surroundings, who will enjoy our "summer place" and this beautiful region of Vermont. The entire condo is available from Oct 15 to Dec 1 2019. Rent includes utilities, condo fees, trash pickup (Tuesdays and Fridays) mornings. Use ONLY "clothes washer" soap in the machine - NOT dish liquid! Canoeing at Emerald Lake 15 mins. The condo we rented from Sally was everything that was described on the internet site and we thoroughly enjoyed our month in Vermont. The unit backs up to great mountain views and it had all the amenities that were described and that we needed to have a great time away from our home in Florida. 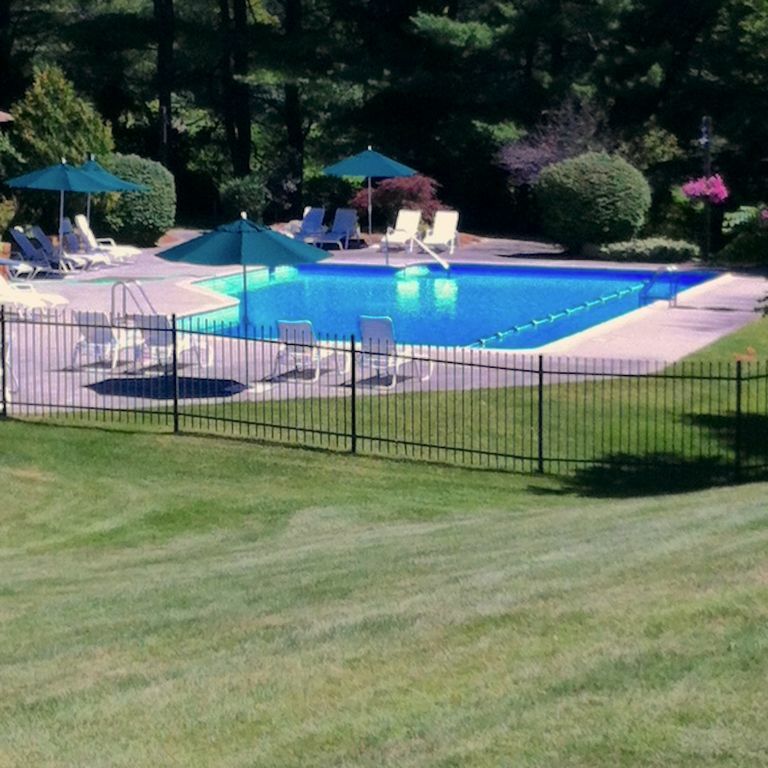 There was even a great pool for our enjoyment as well as tennis courts which we utilized. We would definitely consider renting from Sally again in the future..!! Most gracious, wonderful guests ever! Our place couldn't have been left cleaner - did they really stay here?! Our daughter was in charge of the rental as we weren't able to be in town during their visit. She communicated with us during the month telling us what nice people they are - on our return, I ran into a neighbor who was equally impressed! We highly recommend this family. Our family of four had a great weekend. The kitchen was equipped with anything you could possibly need and spacious. The rooms were well appointed and the beds so comfy. The furnishings through out the home were lovely. Manchester was so quaint and wished we could have stayed longer. Had dinner at a pub on the main street was delicious and service great as well as a local donut shop and plenty of groceries at the local store. Again wished we could stay longer to experience more of the town and home. The kids loved their rooms, especially our 10 year old that insisted in sleeping in the loft. The grill was a nice bonus for a great steak dinner our last night. The views off the decks were beautiful.Thank you for such a great place to stay. We would definitely stay here again! Perfect guests - my place was left so clean that at first I wondered if they'd actually been there! I'd love to host them again any time.